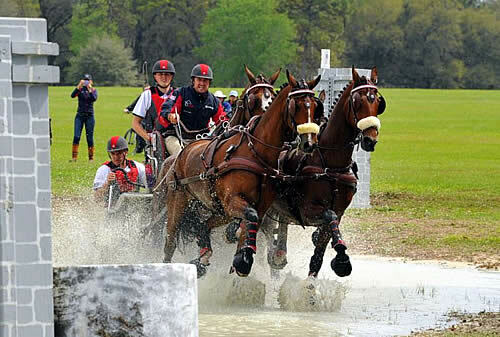 Izsak, Hungary – The United States closed out the 2014 FEI World Driving Championships for Singles on a high note with strong performances in the cones phase. Jacob Arnold and Donna Crookston were among only seven competitors to produce clears on Sunday, while Leslie Berndl also left all the balls in place, just collecting a handful of time faults. With its strong performance on Sunday, the U.S. finished the championship in 10th place on a score of 301.68. Arnold (Snow Camp, N.C.) turned heads in his first World Championships driving Karen K. Chandor and John C. Merritt’s 10-year-old Morgan gelding, Hotspur’s Red Rowl, expertly throughout the weekend. After winning the marathon on Saturday, the 2011 USEF Junior Equestrian of the Year returned with another strong performance in the cones to add nothing to his score, finishing in seventh place overall on a score of 136.95. Crookston (Saltsburg, Pa.) and her 18-year-old Morgan gelding, RG Cowboy’s Black Cadillac, made their fourth World Championship appearance in Hungary, and closed it out with a proficient clear in the cones to earn the Bronze medal in the final phase. They finished in 46th place overall with a score of 164.73. After being forced to retire on the marathon due to equipment problems, Berndl (Newcastle, Calif.) and her own 13-year-old KWPN gelding, Uminco, rebounded in the cones, leaving all the balls in place and incurring just 3.09 time penalties. Germany clinched Team Gold on a score of 266.93, with France claiming Silver on 269.87, and Switzerland earning Bronze on 273.82. In the Individual standings, Wilbrord Van Den Broek of The Netherlands earned Gold on a score of 130.46, while Germany’s Claudia Lauterbach (133.69) and Marlen Fallack (133.85) earned Silver and Bronze, respectively. 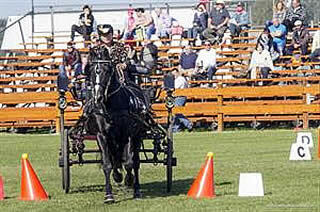 To learn more about FEI World Driving Championships for Singles, visit: http://www.izsak2014.hu/.